As a grower of organic vegetables, i like to maximise the fabulous flavour that they have, and for me this means cooking them with little or no water. Griddling and grilling are both good ways of doing this. The vegetables can be just brushed with good olive oil and sprinkled with seasoning, or marinated with garlic and herbs before the cooking. Another method of keeping all the flavour in the vegetables is to braise them either in their own moisture, or with the addition of a little water, wine, stock or vinegar that is then reduced down to nothing in the cooking. Other flavours can be added to bring out the best in the vegetable. 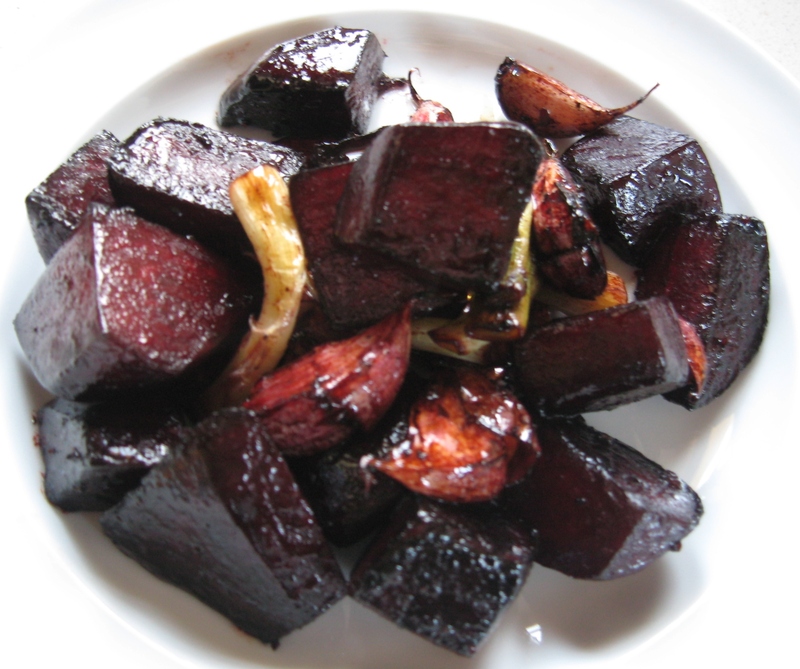 The beetroot pictured above was cooked with balsamic vinegar. For four people, take half a kilo of beetroots, peel the and cut them into bite sized pieces. Put them in a saucepan that has a lid, into which the cubes of beetroot fit in one layer. Add two tablespoons of good olive oil. cover with the lid and put on the heat. Cook for a few minutes shaking from time to time to cover the beetroot pieces in oil. Take a whole bulb of garlic and break it into cloves Leaving the skin on the cloves.With a sharp knife cut half way across each clove. Add these to the pan with two tablespoons of balsamic vinegar and some fnely chopped oregano. Season with sea salt and lots of coarsely ground black pepper. Cover and cooking over a low heat until beetroot is cooked to your preferred softness.i like mine still with some bite, and that takes about twenty minutes or so. By then the balsamic vinegar will have reduced down to a tasty sticky glaze. The Cima Di Rapa, pictured below in the vegetable garden is one of the highlights of the autumn and winter season at La Micaela. 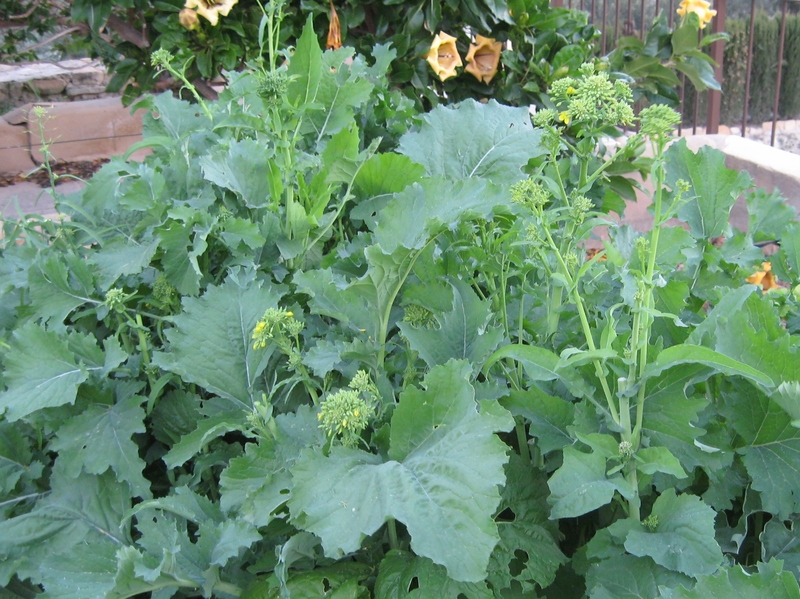 The flower heads are eaten like the purple sprouting Brocolli so beloved in England, but it is ready earlier in the season. From November to February roughly in the climate here in southern Spain, depending on the temperature. 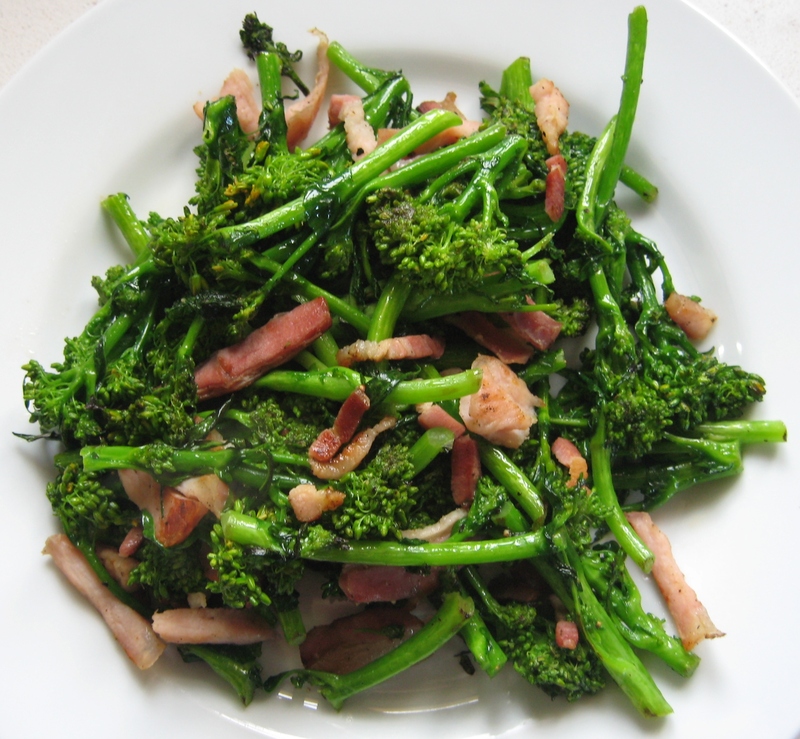 The flavour is a little sharper than brocolli and is complemented by either salty anchovies or in this instance bacon. Broccoli of course can be prepared in exactly the same way. Cut some streaky bacon into thin lardons and fry these in olive oil. Add florets of Cima or broccoli. Toss with thee bacon and olive oil. Season with salt, not too much if the bacon is salty, and freshly ground black pepper. Cover and cook on a low heat until the florets are cooked. if the Cima or broccoli florets are tough, then add half a centimetre of water to the pan at the beginning of cooking and cook until it evaporates. Try cooking shredded cabbage like this. Sprouts work too, although they need a little water adding, enough to go about half way up the sprouts. Cook covered on a more brisk heat until the water has reduced down to almost nothing and they should be cooked through but still retain some bite. 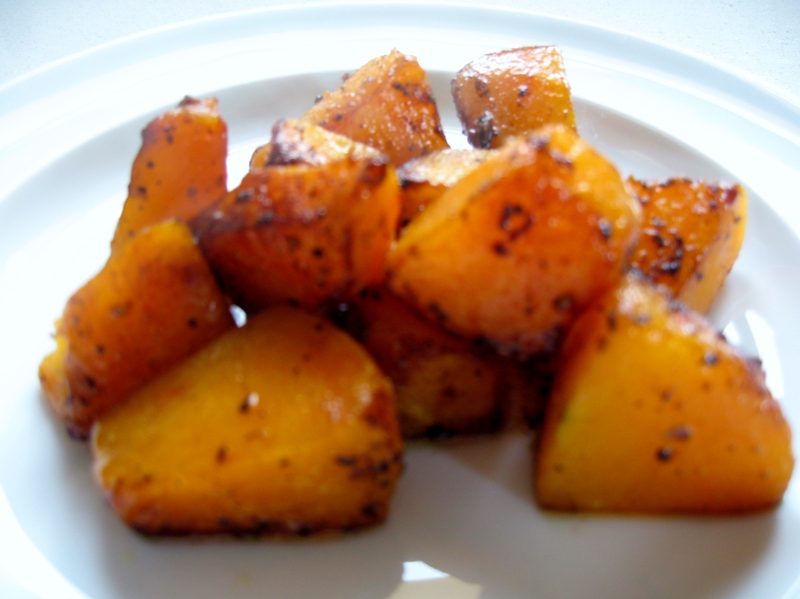 To cook pumpkin, or butternut squash, simply cut into bite sized pieces and cook covered, in butter with seasonings. If you are going on to make pumpkin ravioli, this is an ideal way to cook the pumpkin. Carrots, Swedes and courgettes are very tasty cooked slice this. 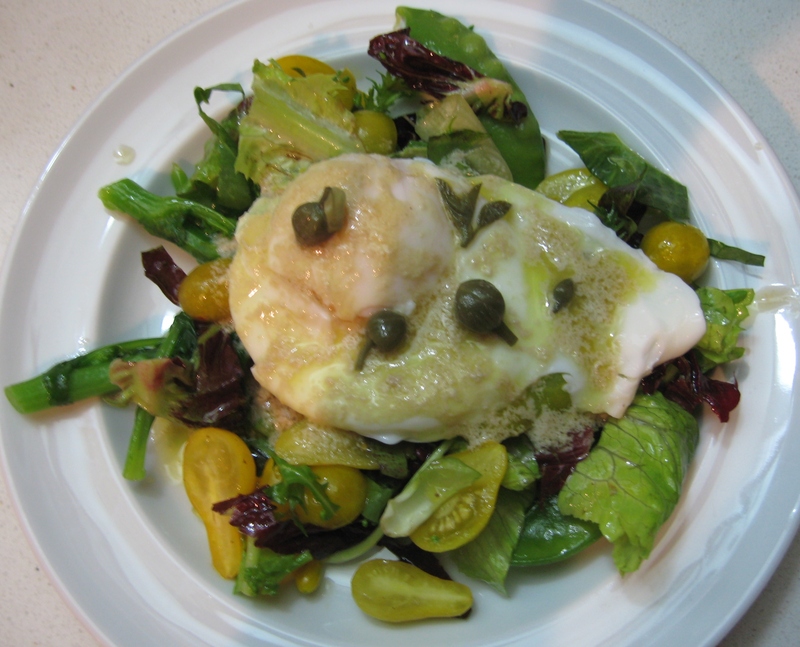 Salad of mangetoute peas, chima di rapa and yellow plum tomatoes with poached egg and smoked fish dressing. When planning a celebratory dinner like that for New Years Eve I generally start jotting down menus several days before the dinner so that I have time to really think through how the meal will be put together on the day. I look through the cupboards, vegetable garden and the freezer to see what I have already that could do with being included. Then I think about how rich or light I want the whole affair to be. After the excesses of Christmas I felt a meal on the lighter side was called for on this occasion. My first draft menu was a starter of Foie Gras with a salad as above but without the tomatoes and with some of the gorgeous figs that I dried this summer, and a ginger dressing. Ginger with Foie Gras is a favourite flavour combination of mine. This I was thinking maybe of following with a fish dish, either salmon or swordfish steaks. I wrote in a previous post of an eleven kilo free range turkey that had come my way which was cut into portions and frozen. I thought I ought to consider turkey for the main course. There were two very good sized legs. Do I bone, stuff and roast them, or will they be too tough prepared like that? A casserole would suit the meat, but is it smart enough for a celebration dinner? I am assured by one of my guests that a Ragu would be perfectly smart enough and welcome change from the richness of the previous days. I have some dried wild mushrooms brought back from a trip to Italy, a perfect accompaniment to the gamey flavour of the turkey. But then brown ragu preceded by brown foie gras would not do. I want to stick with a salad for several reasons, it is a healthy, light and colourful way to start a meal and I have in the garden some tip top ingredients for one, and most of the preparation can be done in advance which means I don’t have to abandon my guests for too long while I serve it up. I have some fresh free range eggs that have come from my neighbour Marias happy chickens, a salad topped with a poached egg would be both colourful and the soft yoke mixed with a tangy dressing would make the salad interesting to the palate. For the dressing I used a tin of smoked fish roe in oil that I pureed and thinned with lemon juice and more olive oil. Having had another look in the garden there are enough baby yellow plum tomatoes to make salads for seven, they are sweet and acidic at the same time and the colour will set off the yellow yolk of the egg. So I recap in my mind the plan. Crispy mixed salad leaves, the baby yellow tomatoes cut into halves, lightly steamed mangetoute peas and cima di rapa which will still be warm when served, topped with a warm poached egg dressed with a thick dressing of smoked fish roe. Some pickled sprigs of capers to garnish. I am happy with that. The ragu for the main course I will serve with steamed new potatoes tossed with chives and butter, and for a vegetable beetroot braised with garlic. I have a good cheese board to end the meal which means that the dessert that I thought I wanted to make will not fit. I make mincemeat each year to sell in the farm shop, and there are a couple of jars left. Having a lime farm the mincemeat is lime and quince, which is wonderfully tangy. I had been thinking to make a cheesecake based on the Yorkshire Curd Tart of a previous post, but in place of the currants and raisins use the mincemeat. I still plan to try it at some point but for this meal it is too rich and cheesecake followed by cheese…..no. How about a little ice cream? Small, light, tasty, perfect. 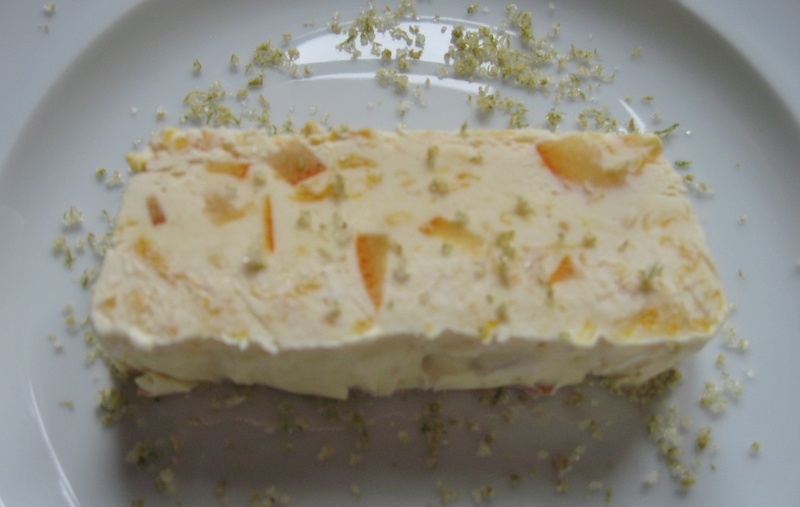 An orange semi-freddo will fit the bill. I will write a whole post on Semi-freddos in the future, but today I will give you the recipe for the Turkey Ragu which was really good. 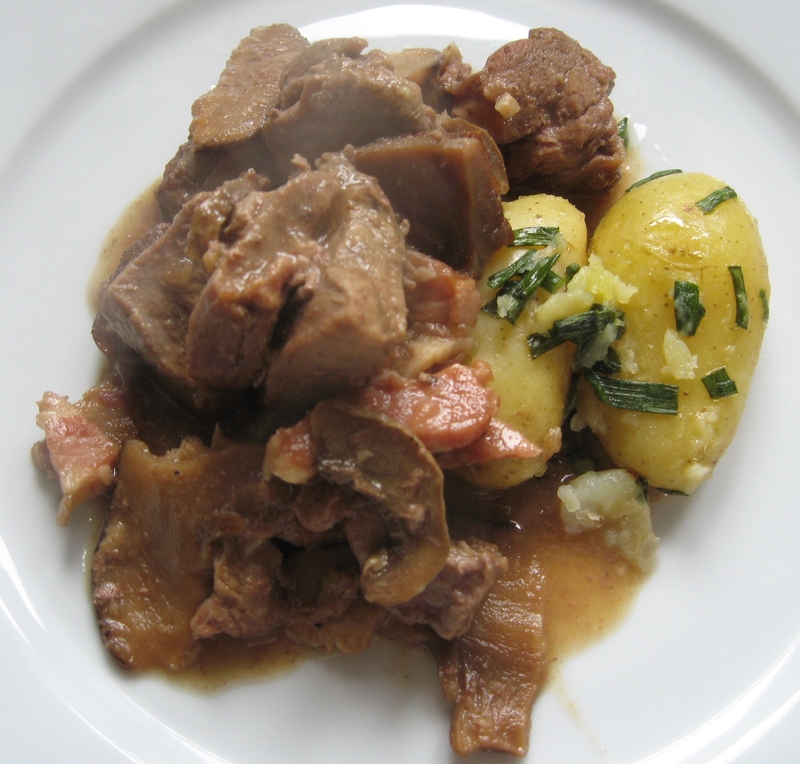 As with all stews it is a good idea to cook it the day before needed to let the flavours mature. As you know there is something about the time and the cooling and reheating that really improves the flavour of any stew. Break the garlic into cloves and peel and chop them finely. Melt some of the fat in a large heat proof casserole. When hot add the onions and garlic. Fry for five minutes or so until transparent. Add the bacon and continue frying stirring from time to time for another ten minutes. Add the turkey pieces. Continue frying and turning the pieces until they are sealed all over. Season well with the sea salt and freshly ground black pepper. Add just enough stock to cover the meat. Bring to a slow simmer and cover. Leave to cook for half an hour. Add the mushrooms and stir in. Continue cooking on a very slow simmer until the turkey is cooked. I thought that the turkey I had, being very large and having run around free would have needed a couple of hours cooking as a minimum, but it only needed about three quarters of an hour more cooking at this point. I would recommend to start checking for doneness after half an hour. Bear in mind as well that with such a large volume of ragu it will retain heat and the meat will continue to cook for quite some time after the heat is turned off. To thicken the stew, melt some of the fat in a frying pan and add to it the two tablespoons of flour. If it is dry in the pan add more fat. Fry slowly stirring all the time until the flour starts to caramelise and turn a fudge brown. Add a ladleful of the stock from the stew and stir into the flour. It will fizz and thicken. Continue adding the stock a ladleful at a time until the sauce is thinner and moveable. Return this to the pan with the meat and stir gently to mix in. Reheat the ragu and serve. I have been pleasantly surprised by how many of you have visited my blog in this the first year. Thankyou for your support and encouraging comments, and I look forward to taking you with me on more culinary adventures in 2013.